This was a 19% increase on the suicides recorded in 2014. Detail Data is reporting on the latest suicide figures almost 10 years after Northern Ireland’s Protect Life suicide prevention strategy and action plan was launched in October 2006 in response to the increasing rate of suicide. Over £50million has been allocated to suicide prevention since the strategy started. 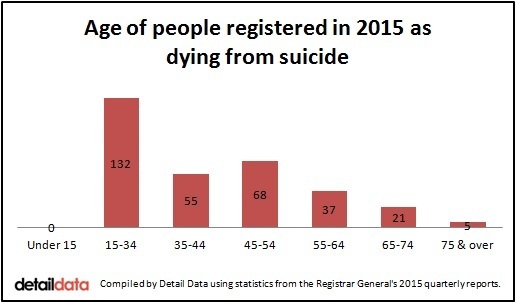 Of the suicide deaths registered in 2015, 77% (245) were male. One hundred and thirty-two were aged between 15 and 34-years-old and five people were 75 or older. Ninety-three people who took their own lives lived in the Belfast Health Trust area - this is 30% of the 2015 total. 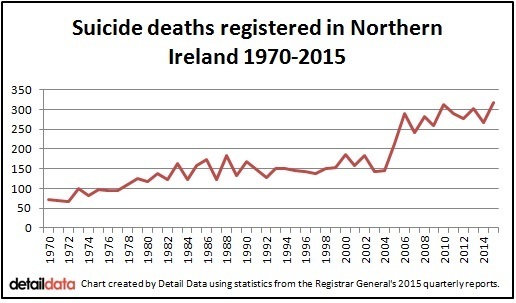 Using historic data held by the Northern Ireland Statistics and Research Agency (NISRA) we have been able to calculate that a total of 7,697 suicides were registered in Northern Ireland from the beginning of 1970 to the end of 2015. Of these deaths, 5,666 were males. Caroline King from counselling service Contact NI stressed that people can be saved from suicide. "It is so important to focus on hope and recovery for people. One death from suicide is one too many," she said. The Detail last reported on suicide deaths in 2014 when we revealed that almost as many people had died from suicide in Northern Ireland since the signing of the Good Friday Agreement as were killed during the entire Troubles. The word ‘suicide’ does not appear in either the 2011/15 PfG or the draft 2016/21 PfG. The Health Minister said it is expected that the suicide rate will be one of the indicators used to monitor the implementation of the PfG. Minister O'Neill said that the suicide rate has "remained steady" since the launch of the Protect Life strategy in 2006. "Undoubtedly, lives have been saved through Protect Life services, but it is not possible to estimate how many," she said. “Efforts to reduce the rate of suicide here need to include broader intervention to improve the life chances and circumstances for more of our people, particularly those who live in deprived areas or who face social exclusion or prejudice. The Minister confirmed that the new 'Protect Life 2' strategy is expected to be issued for consultation in September 2016. Final publication of the strategy is due in 2017. Click here to read the Minister's full response to our questions. High numbers of suicide deaths have devastated families across Belfast, particularly in the north of the city. Irene Sherry, from Bridge of Hope, Ashton Community Trust in north Belfast, said: “Behind the suicide figures are individuals and their families. 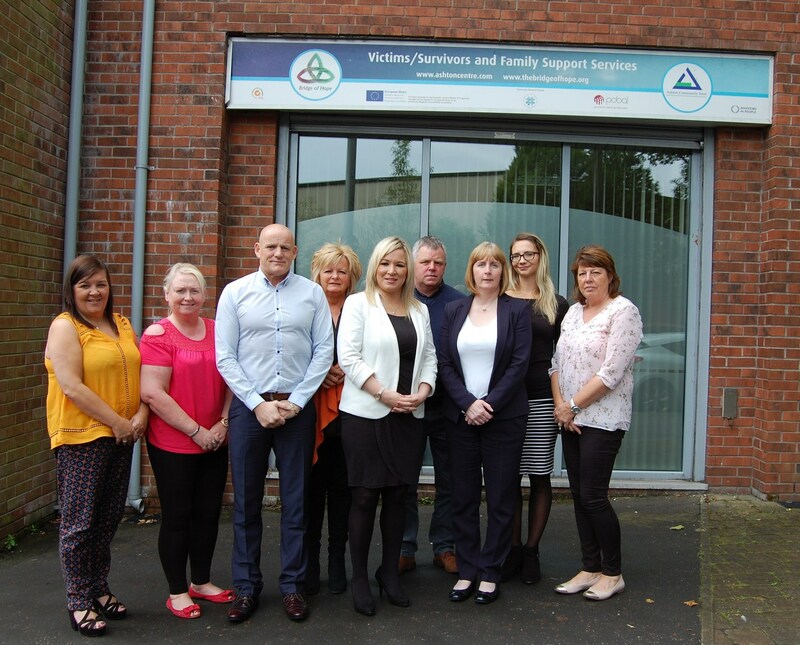 “We have been lobbying strongly for a cross-departmental approach to suicide prevention that collaboratively works with the community sector and there has been a lot of active listening and engagement taking place. We have met with the Chief Medical Officer Dr Michael McBride twice and the Health Minister Michelle O’Neill within the last month. Start360’s Stephen Barr said: “It is complex and emotive and there are huge challenges ahead for the Department of Health. We need to get to grips with the issue of suicide and poor mental health. Caroline King, from Contact NI, said: “When someone dies from suicide, all of us working in this field have a great support system which goes out to families but we shouldn’t have anyone dying from suicide because there is help and support available. Thousands of people come through our door every year with suicidal thoughts and they do recover. “There is a lot of amazing work being done in the statutory, voluntary and community sector and people can access help through their GPs, community centres and churches but there are people who don’t go to these places and it is them that we need to reach. “It is very brave for people to say they are feeling low and have considered taking their own life. We work with brave people every single day and they receive help and support. Clare Flynn, a suicide prevention development officer in east Belfast, said: "One of my concerns is that the current structure of services in Belfast leaves gaps in the services delivered across the city. “Members of the public also have a skewed perception of who is at risk of suicide. It’s not just young people and it’s not just people who take drugs. To label one thing as the cause of suicide is unhelpful and creates stigma. Jo Murphy from Lighthouse said: “I think we need to get back to basics and look at how we build our communities. We need to skill people up to look out for each other. Some people don’t even know who their neighbours are. We also need to let people know that it’s okay to seek help." "There is a lot of great suicide prevention work being done and it could be argued that, without this, the numbers dying from suicide could be even higher,” he said. "Suicide has a huge impact on the families bereaved in this way. Often the hopelessness that their loved ones experienced, they too experience it. Families are also left with the terrible question of ‘why?’, which they may never get to know the answer to. Very often the last time they saw the person they were in good form and seemed to be okay. Mr McGreevy said it is time to think about new and different approaches to suicide prevention in Northern Ireland. "Cancer and HIV/AIDS used to be big taboo subjects in society until people began to talk about them openly. In other parts of the world there seems to be more readiness to encourage people to talk about suicide more openly. We have to tackle the issue openly and directly in a careful and considered way. "If we are serious about preventing suicide then it has to move further up the political agenda. More specific resources need to be devoted to the early and ongoing support for bereaved families. Further investment is also needed in suicide prevention training to identify people who may be at risk and for those who have survived suicide attempts. • To access the suicide data in full, click here. - Lifeline is the Northern Ireland crisis response helpline service for people who are experiencing distress or despair. It can be contacted confidentially on 0808 808 8000.